The Arizona Department of Transportation identified four major highway projects in a Jan. 28 statement that it plans to wrap up in 2019; projects designed to improve transportation of both people and goods throughout southern Arizona. A new I-10 interchange is on track to open this spring carrying Ina Road traffic over the Union Pacific Railroad tracks and greatly improving mobility and safety in a growing area northwest of Tucson. This $128 million project also is widening Ina Road to two lanes in each direction from I-10 west over new bridges crossing the Santa Cruz River, with full project completion expected this summer. 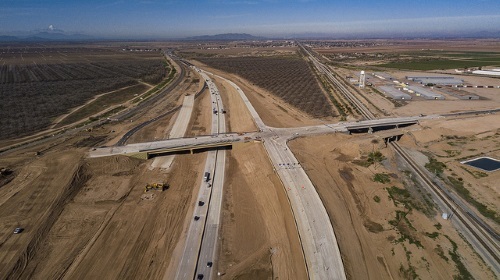 A widening of four miles of I-10 in Casa Grande between Earley Road and Interstate 8. This $43 million project, scheduled for completion by late summer, includes replacing the original bridges over Jimmie Kerr Boulevard to accommodate three lanes in each direction. A separate $72 million project widening a different four-mile stretch of I-10 to three lanes in each direction will include a new State Route 87 interchange and what’s being touted as a “first-of-its-kind” dust detection zone on 10 miles of I-10 to provide drivers with crucial safety information during dust storms. Completion is scheduled for late summer. Finally, a new $55 million overpass that will carry State Route 347 traffic over the Union Pacific Railroad tracks in Maricopa is scheduled for completion by the end of 2019. Design work is also set to begin by June on what the Arizona DOT is calling its “largest project” of 2019: a $134 million upgrade of State Route 189, which connects the Mariposa Port of Entry with Interstate 19 in Nogales and carries a large share of produce entering the United States. Planned upgrades include flyover ramps to make a smoother transition between SR 189 and I-19 and a bridge over Frank Reed Road that will improve safety near Nogales High School. The two-year project is expected to be completed in 2021. In Tucson, construction is scheduled begin this summer on a new interchange at I-10 at Ruthrauff Road. The $101 million, two-year project will be similar to interchange improvements at Ina and Prince roads. Other major projects the Arizona DOT expects to begin in 2019 include replacing the 70-year-old Pinto Creek Bridge on US 60 east of Superior and repaving a 7-mile section of State Route 95 north of Parker. The agency said bidding for the Pinto Creek work will take place early this year, while paving on SR 95 began earlier this month and is expected to continue until fall.